The role of Honorary Chair is reserved for leaders in the field of wine who have demonstrated a sincere appreciation for Washington’s industry. The annual roles of Honorary Vintner and Honorary Grower are peer-nominated, bestowed upon individuals within the Washington wine industry who have made or are making an impact. 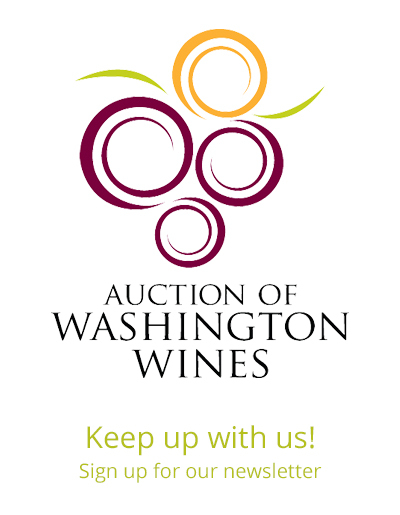 “For 30 years, the Auction of Washington Wines has been very fortunate to have such impressive leadership to recognize – and this year is no different,” said Sam Baker, Board President and partner with Oles Morrison Rinker & Baker. Thomas Matthews joined Wine Spectator in 1988 as a reporter in the London office and was quickly promoted and moved to New York where he has been serving as the magazine’s executive editor for 18 years. He is the lead taster for the wines of Spain and one of the magazine’s principal restaurant reviewers and travel writers. Wine Spectator is the largest-circulation wine magazine in the world with more than 3 million readers for each issue. Kelly and Chris Sparkman launched Sparkman Cellars in Woodinville, Washington in 2004. “It all synced up with our family’s vision: working with the finest raw ingredients this planet has to offer, crafting from it something real and living, and sharing it with folks who are literally thirsty for it.” says Chris. Sparkman Cellars 2013 Holler Cabernet Sauvignon was named #21 on the 2016 Wine Spectator Top 100. The winery has also been named one of Wine Spectator’s Rising Stars, Wine Enthusiast’s Cult Winery and Wine & Spirits’ Top 100 Wineries in the World. The 2013 Birdie Riesling was named the #7 Wine in the World by Wine Enthusiast. Chris has been chairman of the Washington State Wine Board of Commissioners, served on the Auction of Washington Wines Board, and currently serves as a member of the Board of Directors at Visit Seattle. He has been instrumental in helping to guide the marketing of Washington wine during critical growth years of the industry. The Sparkman family has made a priority of contributing to causes within the community through the winery since the beginning. Tom Merkle is a second-generation grape grower who began his career working with his father on family owned orchards in Outlook, WA. After being lured away by Boeing for a few years, he eventually returned to Eastern Washington to accept a management position for a local vineyard/orchard company. He planted the first grapes at his own Wautoma Springs vineyard in 1999 and sells to some of the most well-known Washington wineries including Northstar and Charles Smith wineries. In 2008 Tom partnered with Jessica Munnell to create Wautoma Wines to showcase the unique fruit from Wautoma Springs vineyard. Tom continues to expand his personal holdings which include some of his father’s original wine grape plantings. He is also carrying on the tradition of mentoring his son as he begins his career in the wine industry. Tom is committed to the Washington State wine industry and is currently serving on the Walter Clore Wine Center Board of Directors and is employed by Zirkle Fruit Company, overseeing multiple vineyards in numerous AVAs. Since its inception in 1988, the Auction of Washington Wines has raised more than $37 million. The distinguished fundraising events give wine lovers the chance to support the Washington wine industry and families in the communities around the region. The 2017 events will take place August 17-19, 2017. Co-chairs for 2017 are Norm McKibben and Jean-Francois Pellet of Pepper Bridge Winery, Yahn Bernier of Valve Software and Beth McCaw of Washington Women’s Foundation. Major sponsors include Chateau Ste. Michelle, Ferrari of Seattle, Bank of America, John L. Scott Foundation, The Seattle Times, King 5 TV, Tulalip Resort Casino, and Alaska Airlines Visa Signature Card.